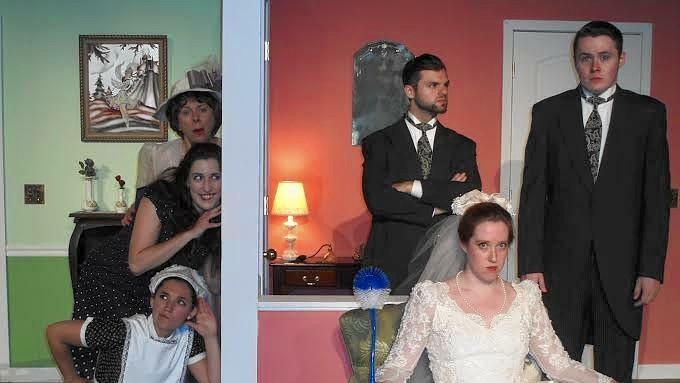 From Sept. 11-27, the Towle Theater will conclude its 2015 season with the Indiana premiere of the British farce comedy, “Perfect Wedding,” by Robin Howdon. In “Perfect Wedding,” on the day of a groom’s wedding, he wakes to find a strange woman next to him in his bridal suite, is plagued with a hangover, and is unsure of who the woman is, or the events of the previous night that led him to this predicament. The best man attempts to help, and the situation snowballs into a hush-hush situation concerning just about everyone involved in the wedding day plans. Jeff Casey, producer and lighting designer, is excited for the upcoming show. “I’m not typically a fan of British farce, but when I read this script, I laughed out loud. It’s a romantic comedy as well as a British farce. When there’s a lot of heaviness in the world, people turn to comedy for relief. You laugh out loud, and people really need that sometimes,” said Casey. Towle Theater is thrilled to welcome newcomers Jerico Bleu, Stephanie Rohr, Rachel Silvert and Linda Roberts to the show and to welcome back Ian Rigg and Lauren Knutson. Casey mentioned that the cast bonded quickly. “When I come in, I get to marvel at how the chemistry has developed between the cast. It’s totally believable on stage that they’ve known each other for a long time and have a genuine caring for each other,” said Casey. Perfect Wedding is a new show for Indiana, he said. “The sense of lightheartedness, humor and a quick pace brings a really strong comedy element to the stage that people in the area need,” said Casey. Tickets are $17. Children under the age of 6 are not permitted in the theater. Free parking is available off of Fayette Street. Friday shows are buy-one-get-one-free ticket for educators with valid ID. On Sept. 24, theater industry people are also offered a buy-one-get-one-free ticket offer with a picture or playbill. Reservations for all discounted tickets are mandatory.